Parrots are a diverse group of birds that include more than 300 individual species, of which approximately 150 are kept as pets in the United States. Most parrots are herbivorous and eat a variety of foods in the wild; others have extremely specialized diets and only eat one or two specific foods. A few species are omnivorous and consume insects during breeding season, although this is of little consequence to the pet owner. There are three basic forms of "base diets" that make up the majority of a pet parrot's food intake: seed-based diets, formulated (pelleted) diets and cooked diets. Each has advantages and disadvantages, although seed-based diets are not recommended for most species because they are deficient in several important vitamins and minerals, particularly Vitamin A and calcium. Seed-based diets do have the advantage of being readily accepted by nearly every parrot. Formulated diets meet basic nutritional needs that are shared among all species, but additional supplementation--usually in the form of fresh foods--are necessary to maintain the health of most species. Cooked diets may be prepared from scratch or purchased in ready-to-cook packages. These diets contain the necessary fruits and vegetables that most parrots require but spoil quickly and are not always nutritionally complete. When choosing a diet for a pet parrot, it is important to consider any species-specific nutritional needs, if that information is available. Unfortunately, the nutritional requirements of parrots are not well-known, except for the most commonly owned species. 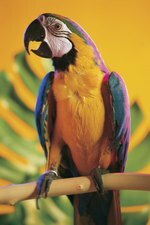 Most parrots do well on a formulated diet that is supplemented with fresh fruits, vegetables and, in some cases, nuts. Amazon parrots, cockatoos, and Eclectus parrots should be fed few, if any, supplementary nuts because they are prone to obesity when fed a calorically dense diet. On the other hand, macaws and conures of the Aratinga genus require more fat than is typically included in a formulated diet, making the addition of nuts in this case very beneficial. Hyacinth macaws, in particular, require a large amount of nuts in their diet to maintain their health; in the wild, these birds subsist only on the nuts of the queen palm tree. Eclectus parrots are unusual in that they should not generally be fed a formulated diet; in the wild, they are almost entirely frugivorous. They have an unusually long intestinal system and can absorb excessive amounts of vitamins if they consume a nutritionally dense diet. This species requires a large quantity of fresh produce fed daily along with grains and a small amount of protein-containing food such as cooked legumes. One common source of confusion in feeding pet parrots is the species' recommendations on packaged bird foods. Unless the package specifically states that it is formulated to meet the nutritional requirements of particular species or group of species, the recommendations reflect the size of the pieces of food rather than nutritional content. This is especially true in the case of formulated diets; pellets sold for budgies are nutritionally identical to those sold for macaws or cockatoos. The pellet size chosen should be based on what the parrot prefers (and is therefore more likely to consume) rather than on what the package indicates. Most conures, for example, prefer pellets sold for large parrots because they tend to eat while holding the pellet in their foot. On the other hand, small parrots that eat by picking food up directly with their beak may be unable to eat very large pellets. Small pellets rarely present problems, even for very large birds, and can help reduce the amount of food that is dropped and wasted. Many people are surprised to find that it is perfectly safe, and often desirable, to feed pet parrots food from one's own table. Assuming that the food is healthy, not heavily salted, and portion sizes are kept small, most parrots benefit from occasionally eating "human food." A typical parrot diet does not contain much variety, and because the exact nutritional requirements of most parrots are not known, micronutrients that are not supplied in commercial diets can be obtained this way. All parrots should be offered a portion of fresh or cooked fruits and vegetables each day for the same reason. Most nutritional supplements sold for birds are best avoided except on the advice of an avian veterinarian. These vitamin and mineral supplements are not only unnecessary but in some cases can lead to toxic overdoses of Vitamin D and synthetic Vitamin A. The exception to this is calcium supplementation, which most parrots do require. Placing a cuttlebone in the cage usually provides sufficient calcium. Most table food is beneficial or at least harmless to pet birds, but there are some exceptions. Foods that are high in salt, sugar, or very high in fat are usually best avoided, as are most foods that contain milk products. Because birds are not mammals, and therefore do not drink milk, they are invariably lactose intolerant. A few varieties of produce can cause toxicity in birds; these include avocado, onions, garlic and raw rhubarb. Spinach should only be fed in small quantities, especially if it is uncooked; spinach contains oxalates that bind to calcium and, if fed in large quantities, can provoke calcium deficiency. Aside from these exceptions, the general rule of thumb is that if a food is healthy for you to eat, it is probably healthy for your parrot. It makes sense to share a low sodium stir-fry with a pet parrot, but one should not allow their bird to eat ice cream or french fries.